He hated slides because the images were never bright enough and the control technology which was affordable for small and mid-size theatres was clunky and slow and unpredictable. If you tried to do anything clever and complicated, a projector would invariably jam and a slide would burn up and the whole effect would be ruined. The summer before Macbeth, ATL conducted a workshop to explore ways to combine high- tech and low-tech. Among other experiments, they shone their new digital projectors into mirrors which were then moved around to alter and warp the projected images. They also projected images onto three-dimensional surfaces. Masterson had seen this technique used very effectively in a piece called Invisible Skin by the video artist Valerie Sullivan Fuchs when it was exhibited at the Swanson Reed Contemporary gallery in Louisville. Fuchs’s work frequently incorporates modern and ancient technologies. For Invisible Skin, she projected images of waves, the ones generated by boats moving up and down the Ohio River, onto a clay piece that was etched with patterns of concentric circles. The interplay of the clay object—an ancient technology—with digitized images of waves—the natural forces that create clay—was the same kind of thematic idea Masterson was exploring in Macbeth. Fuchs was invited to join the design team. As Masterson said, “I drew her into this murky production...and probably here too, ignorance was a real asset. She had no idea what she was getting into.” Fuchs was excited and immediately agreed even though, as she admits, she had no experience in theatre, she didn’t know the creative process, or the traditions, or the kind of work that goes on in rehearsals. Other key players in the Macbeth workshop were Jason Czaja, audio supervisor, and Cobert Davis, assistant sound designer. They were responsible for providing the multimedia technology and making it work. From the beginning, as the creative team started to develop a page-by-page storyboard, Czaja and Davis realized they would need to invent control systems that were much more flexible than the kind of DVD playback systems the theatre currently owned. 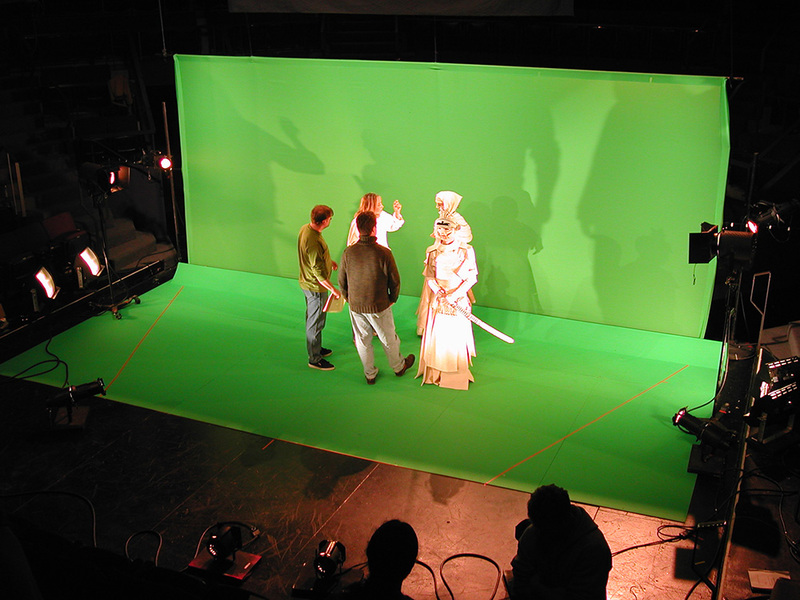 In 2001, digital video processing was just migrating onto personal computers so Czaja and Davis spent several weeks searching for and evaluating software applications that might meet the considerable needs of the upcoming production of Macbeth. They settled on two applications: Production Designer (www.wetelectrics.com) is software for synchronizing and outputting video, audio, MIDI, and serial elements of multimedia presentations; and VDMX (vidvox.com) is a software-based video mixer tuned for real-time performance of audio visual material. VDMX’s creator, Johnny DeKam, worked closely with ATL, going so far as to modify the software to accommodate the way ATL was using MIDI for controlling some sequences of cues. In production, there were four computers controlling video input from disk and from four live hand-held cameras. Output went to four projection screens. “One of the key questions,” Masterson continued, “was timing. How fast do these images move.” Their main concern was pulling focus away from the actors, and early on realized that, in general, the projected images should move very slowly. Fuchs said that in her work, the video image, which is animated, not still like a painted scene, changes the object onto which it is projected. It gives the object a spirit, or a spiritual quality.